Cassia Vs Ceylon: Will The True Cinnamon Please Stand Up? If you are like most shoppers, you may not give much thought to the cinnamon you buy/use. You look for cinnamon sticks or ground cinnamon on the spice rack at the grocery store, toss it in your cart, and keep on moving. However, cinnamon is a diverse spice. By becoming familiar with different types of cinnamon, you learn how to choose the right type for health. Discover the many types of cinnamon in the market, and understand which one you should be buying. How Many Types of Cinnamon Are There? In truth, there is only one type of real cinnamon. It is called Ceylon cinnamon. The science name is Cinnamomum verum. The word “verum” comes from the Latin word “verus” for “true“, which is why this specie of cinnamon is being referred to as the “true cinnamon”. It rolls up into a long tubular form, rather than into two scroll-like tubes. It tends to be fairly thin and brittle, not thick like the cinnamon often found in American grocery stores. This cinnamon carries subtle notes of citrus fruits, floral scents, and pine. Most stores carry the cassia-type cinnamon, unless the packaging is specifically labeled as “Ceylon cinnamon” or its science name. Apart from the packaging label, there is almost no way to tell which cinnamon powder you have in hand; but, the aroma of the true cinnamon would probably give it away. Ceylon cinnamon has a heavenly, pleasant sweet fragrance compared to the common cinnamon. If you are familiar with the smell of Cassia cinnamon, you could probably tell the vast difference when you encounter the delightful Ceylon cinnamon. As for the cinnamon sticks, perhaps the best way is to see how different they look in the image below. The Cassia cinnamon (left) is rolled up like a thick bark layer in one neat piece. It is tough and difficult to grind and may be even difficult to digest. Its color is reddish dark brown. 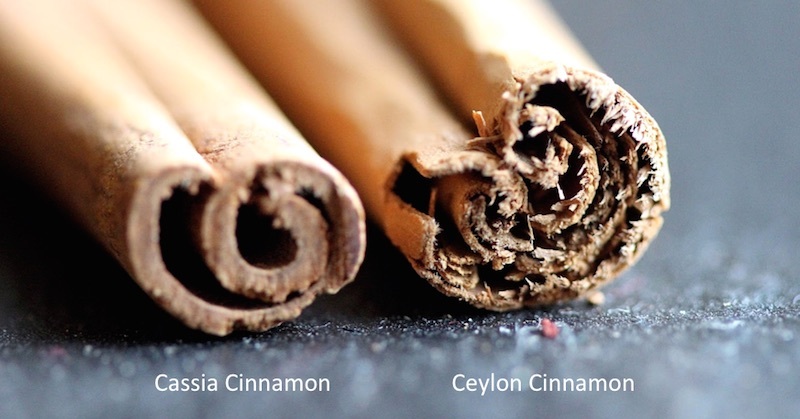 The Ceylon cinnamon (right) has a thinner bark and you will see that when rolled up it appears as multiple layers and has a tanned brown color. This true cinnamon is more fragile, brittle and can easily be broken and ground into fine powder. Ceylon cinnamon is one of the foods that are recorded for having the highest content of antioxidants. Although it may be difficult to find it in stores, even more expensive if you do find it, it really does a big difference when you consume the true cinnamon. Blood sugar regulation: Keeps your blood sugar levels stable, prevents the development of diabetes and other blood-related diseases. Decrease in sugar intake: Although cinnamon is not technically sweet, it stimulates the sweet response in the human body. As a result, you may have fewer sweet cravings and decrease the amount of sugar you eat. Improves heart health: Consumption of Ceylon cinnamon seems to decrease triglyceride levels and boost antioxidant levels in the blood. This is of particular importance in the United States, where heart disease is the #1 killer of adults. Supports healthy blood clotting: Ceylon cinnamon is effective as an anti-coagulant that acts as a blood thinner. Patients who are taking prescription blood thinners are cautioned not to consume cinnamon in concentrated form such as supplements or extracts. Supports the immune system: The true cinnamon has long been used for its potent anti-microbial qualities that supports the immune system and prevents colds and flu. Mental acuity: Even just smelling Ceylon cinnamon may improve mental function and performance. Imagine the greater effect for those who consume the true cinnamon. It has been shown to enhance cognitive processing and improve visual-motor speed, memory and attention to detail. Improves digestion: Consuming the right cinnamon helps to reduce flatulence, nausea and diarrhea, all ailments related to the digestive system. Clearly, Ceylon cinnamon is the best spice for you if you want to improve your health. However, cassia may also have some health benefits. If you are choosing cinnamon for taste, try each type of cassia to see which taste you like the best. You may want to switch some of the cassia in your diet for Ceylon cinnamon, even if you don’t get rid of cassia completely. Cassia is high in coumarin, a phytochemical that may be harmful for the liver and kidneys, when consumed in excess amount, though not a concern for occasional use in cooking for the taste and fragrance. If you live in the U.S., you may buy Ceylon cinnamon from Amazon and they have quite a good range that are reasonably priced.